Generally, beta versions will be available only through Steam. 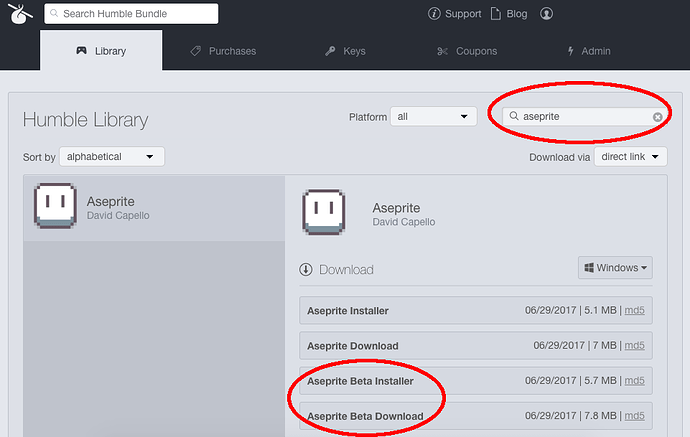 You can switch/access to the latest beta version from Aseprite properties. See how to do it. If you don’t see these “Aseprite Beta Installer/Download” buttons, press Ctrl+R or ⌘R in your web browser when you’re in your Humble Bundle library page. If you still don’t see the beta version, it’s because there is no beta version available to be downloaded as a standalone (only through Steam). No reference layer on STEAM? Are you going to upload all future beta versions to Humble Bundle, itch.io, and Gumroad? I’m not sure, maybe v1.3-beta will be available only through Steam again, or I’ll start to make beta versions available with other methods (e.g. from a special login to aseprite.org for customers only). I am gonna reply to all of the posts . Thanks! I will use that feature! why my aseprite steam version won’t update automaticly? still stuck on beta9. Could you please try restarting Steam? That should work. I bought Aseprite via Steam and would like to know how I could get access to it by other available methods (itch-io, humble bundle and etc). Sometimes I need to access it from a PC without access to Steam. Hi @wesleysales3d, I’ll send you a link via private message that I’m testing for Steam customers to access to standalone versions. Hi, I bought aseprite via steam and I would like to get the beta version but I followed the steps of the video but when I try to change from no beta it doesnt let me, I think you have to send me a code or something but can you pls help me? Hi @Hermanator, you have to close Aseprite first, and then open Aseprite properties from Steam.